In Belgium, as in many other countries, the public debt significantly increased after 2007-2008 as a result of the socialization of private financial institutions debts and the crisis they created. It rose from 285 billion euros (84% of GDP) before the crisis to 395 billion (100% of GDP) in 2013. This partly undid the efforts made during the past twenty years which had reduced public debt from 140% to 84 % of GDP. But there are other causes of public indebtedness in Belgium, once again comparable with many other countries: the explosion of interest rates in the eighties (up to 14%! ); a socially unfair tax policy (with many tax reforms that benefited the rich and big companies and provoked a loss of revenue that had to be compensated for by loans from the financial markets); a socially unfair monetary policy (that prevents the central bank from lending to the State which is obliged to accept the conditions of the private market – between 1992 and 2011 the State would have saved 250 billion euros if it had borrowed at 1% interest rate…); useless and illegitimate expenditures; etc. The consequences of those neoliberal policies (and of the capitalist system, in general) have been quite clear for a long time for the population in Belgium: (direct and indirect) wages and public services have been losing out to the benefit of profit for now more than 30 years. But things have deteriorated since the last crisis with, each year, some added austerity measures on the excuse of this debt service which reaches 45 billion of euros a year (the first item of expenditure, that represents 20% of all). So far the most important ones occurred in 2011 below the ‘socialist’ government with cuts on public transports, civil servants, international cooperation, ecological transition supports, health care; pension system reform; an aggressive reform of the unemployment benefit system and a wage freeze. Of course we can expect much more after the European, federal and regional elections of 2014. Those measures hit firstly the poorest sectors of the population (with women in the front line), and the “crisis” situation is used to create a xenophobic atmosphere and to divide the population. A lot of big companies (Arcelor Mittal, Ford Genk, Caterpillar, etc.) closed down, leaving hundreds of thousands without resources. Many people continue to think that Belgium is an exception and that we won’t be in trouble as countries of the “periphery” are. The mass media and public authorities are working in feeding this fantasy in the population’s mind. But each month more people are becoming more ‘indignad@s’ and each month more people are organizing to change the situation and the system which created it. 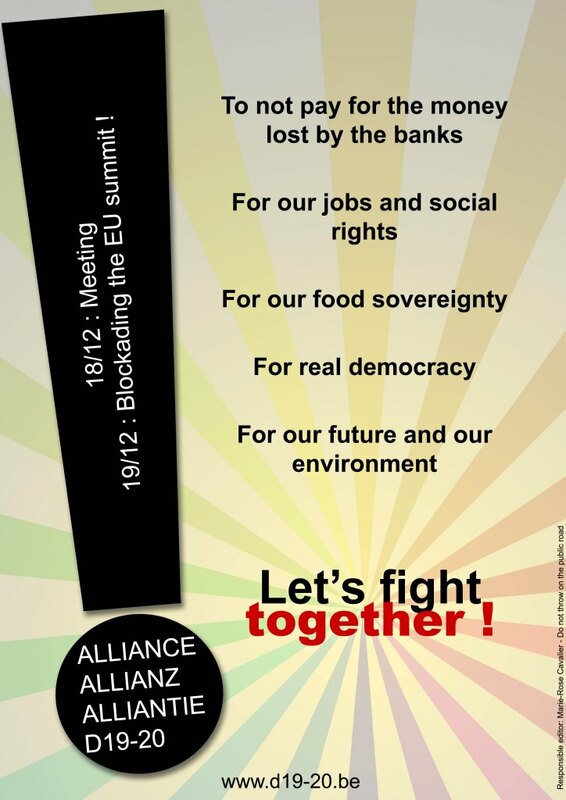 Beyond all the small scale resistances, let us list a few important movements: the struggles’ convergence initiative of « Alliance D19-20 » launched by the milk producers whose agenda is the fight against TSCG, TAFTA and austerity measures in Belgium and Europe; the initiative to gather a maximum of field actors before the 1st January of 2015 (when 35,000 people will lose their rights to un-employment allocation) to cancel this reform; the call from a section of one of the biggest trade union (FGTB-Charleroi) to unify the forces present at the left of the ‘socialist’ and ‘green’ parties to create an anticapitalist relay alternative; and of course the citizens’ debt audit campaign. This one named « à qui profite la dette ? » was launched on November 2012 by four organizations (amongst them the CADTM) with a book, a small video that went viral, posters etc. Quickly, local groups were created to begin the audit process (with research/analysis and awareness/mobilization working groups) and a national coordination was created in February 2013. We are right know working on national, regional, local, gender, ecological, social security and hospitals audits. We will soon launch a website for the citizens’ platform and a guide for a citizen audit in Belgium. There are more or less ten local groups and twenty organizations participating in the process. And it’s just a beginning… We need to retrieve control of our indebtedness and of the economic orientation of our society.